After a years hiatus (due to personal health reasons) Tölt News is back and better than ever! We have made some changes that we hope you will enjoy. We continue to strive to inform our readers and promote the Icelandic horse wherever we go. Learn more about the Icelandic horse and read Tölt News! The magazine is published two times a year: late spring and late fall. It is chock-full of great information, and has everything Icelandic horse related you could think of. One of the new changes is that now you can get a ‘super’ subscription and receive not only a calendar filled with beautiful images of our beloved horse breed, but you will also receive your very own copy of The StudBook, the stallion book of North America. 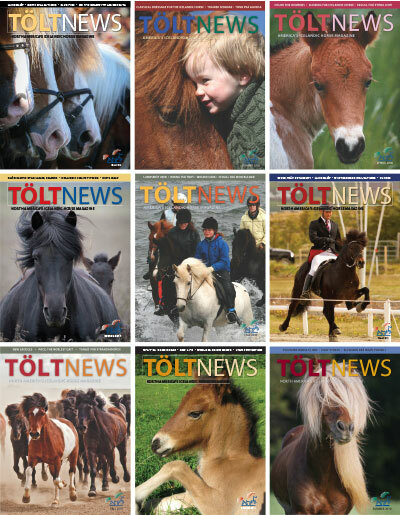 Tölt News is a place were you can find all the information you can think of about what’s going on in the Icelandic horse community in North America and abroad. It has information about events, breeding, training, tack and travel, resources, events and much more. It is a place where you can always discover something new, guided by reviews and personalized recommendations. It is a magazine staffed by people who are passionate about the Icelandic horse. Tölt News was founded in 1999 by Martina Gates and Andrea Barber. Martina at the time felt that there was a need for a different kind of Icelandic horse publication in North America, with subjects related to what was relevant to what was going on with the horse on the American shores. In the years since, a lot has happened and changed with the Icelandic horse here (for example, it is better known), and Tölt News has continued to bring its readers stories about news, events, celebrations, training tips, horse stories, and so much more. In late 2010, Martina passed the Tölt News reins to her business partner and friend, Thorunn Kristjansdottir. Martina has, however, remained a contributor to the magazine. Thorunn’s pledge is to keep Tölt News at the forefront of Icelandic horse news and happenings, just like Martina did for 12 years. She unfortunately had to take a years hiatus a year later due to personal health reasons, but was thrilled to bring it back in 2012. She along with Cindy Wescott have revamped the magazine and are thrilled that it is back! Please feel free to contact Tölt News if you’ve got any questions, suggestions and or comments.